The lobby is an impressive representation of the first class luxury offered by this hotel. 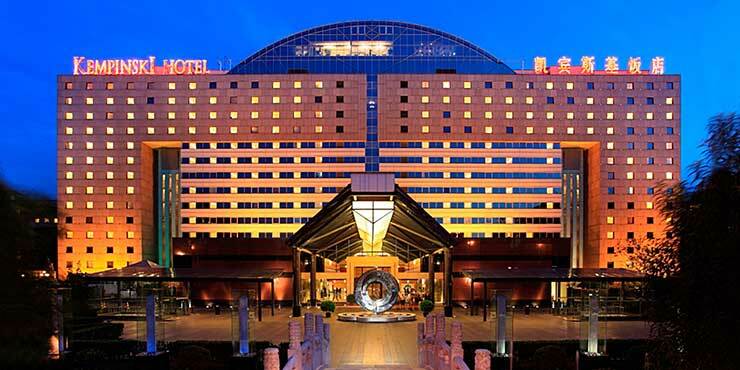 The Kempinski Hotel Beijing Lufthansa Center is situated in Beijing’s famous diplomatic district of Chaoyang. The 526 hotel rooms and suites of the luxurious five-star hotel offer timeless comfort, blessed with stunning views of either the Liangma River or Beijing’s skyline. Infra-red controlled GROHE Europlus E fittings in the public restrooms provide optimum user comfort thanks to high quality GROHE technology. With touch-free operation, the electronic control starts the flow of water by detecting an approaching hand, and stops the flow of water automatically as soon as the hands have been moved away from the faucet.